The benefit of implementing this interface in a collection is that several consumers of the collection can enumerate it without interfering with each other. Enumerable can be thought of as "IEnumeratorProvider". However we have a great syntactic sugar for Enumerable: foreach. The compiler will convert the former foreach into the previous enumeration using the underlying Enumerator. We normally will make use of the generic counterparts, IEnumerator<T> and IEnumerable<T>. One of the main advantages of using the generic version is that IEnumerator<T> inherits from IDisposable. 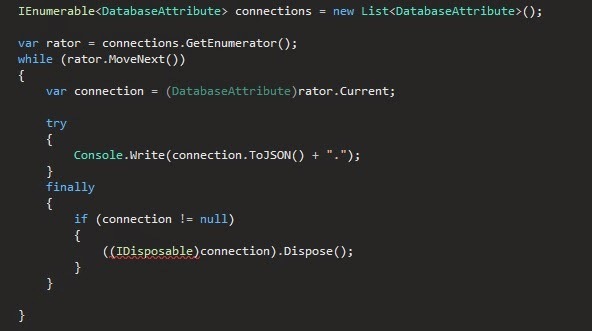 This allows us to have a collection on which every element can be disposed, like a database connection. So let's go to the point of this post. Let's see real magic in action. If we compare the first piece with the last one we can save a few lines of code. This is the magic that happens behind the scenes if we call a foreach using a disposable collection.